FREE Tan Towel when you purchase a Spray Tan. Extend your healthy glow and avoid damaging sun burns. SAVE $50 on a package of 3 Dermaplane treatments – just $250! Your face will feel fresh and hair-free for summer. FILLER SPECIALS! Get a FREE vial of Volbella (a $400 value) when you purchase 2 vials of Volluma or Vollure. Or save half off one vial of Volbella when you buy one vial of Vollure. July is Acne Awareness month! 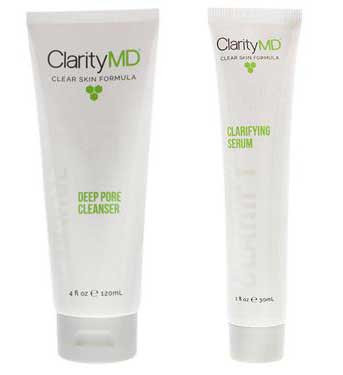 SAVE 15% off either Clarity MD Deep Pore Cleanser ($15.30*) or Clarifying Serum ($18.70*) These products contain PCX technology, a breakthrough development that utilizes the potent combination of salicylic acid, bakushiol andbisabolol. PCX helps to target acne more effectively, without the side effects of other acne products such as excessive dryness, stinging, and redness/irritation. Offers valid through July 31, 2018 or while supplies last. Call 1-800-A-NEW-YOU for more information or to schedule an appointment.